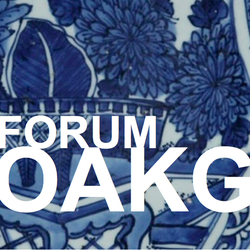 The Forum East Asian Art History is an annual meeting of junior faculty members, postdoctoral researchers, and doctoral students in the field of East Asian art history or related fields. Since East Asian Art History as an academic discipline in the German-speaking area is institutionally placed between East Asian Studies and an Art History focusing on Europe and America, the Forum aims at providing our field with an independent platform. The 7th Forum will serve as a venue for presentations on individual research projects and for the discussion of methodological and institutional perspectives in the field. We encourage proposals for reports on ongoing research projects and graduate theses. Papers with a focus on art objects, collections or art historical periods that have been neglected by research so far are particularly welcome. We also invite proposals for themed panels with three to four speakers. The program will additionally include a section with reports from the institutes. The organizers at the University of Vienna are pleased to host the Forum for the first time in Vienna. To apply for a twenty-minute presentation, please send an abstract of 300 words and a short CV (max. 1 page) to Alexandra Wedekind (alexandra.wedekind@univie.ac.at). Panel proposals should include abstracts for the panel and for each paper. Deadline for submissions is the 20th of February, 2017. The Forum will be held in German and English. Unfortunately, we are unable to provide financial assistance for traveling costs. We therefore ask participants to secure travel funding from other sources. Sabine Bradel (Universität Zürich), Hanna Brinkmann (Universität Wien), Maximilian Bürger (Ludwig-Maximilian Universität München), Ronald Kiwitt (Freie Universität Berlin), Fabian Kommoß (Universität Potsdam), Alexandra Nǎchescu (Universität Wien), Katharina Rode (Universität Heidelberg), Maria Sobotka (Freie Universität Berlin) and Alexandra Wedekind (Universität Wien).